Here is one of the great examples of why MGM rose to the top of the film industry in the 1930s. Though somewhat stiff in places, it holds up very well as an exercise in star-powered ensemble playing. That old workhorse of a plot - bringing a variety of people together in one place and then intermingling their fates - is given an extremely satisfactory treatment here. 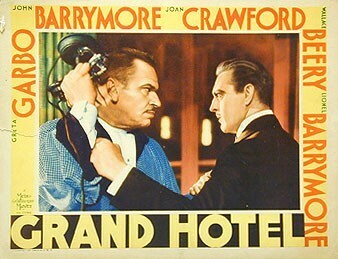 Perhaps the best thing about this movie is the by-play between John and Lionel Barrymore. The fondness they felt for each other in real life comes shining through, and their moments onscreen together are beautifully and touchingly believable. The one casting misstep was Wallace Beery as Preysing. What was likely imagined as his character's air of Teutonic superiority comes off mostly as boorishness. Also, he is the only American actor in the film who speaks with a German accent, and not a consistently believable one at that. Garbo is a compellingly tragic figure in this film, which features her famous, oft-repeated line, "I want to be alone". A great actress in a great part. Joan Crawford as the stenographer Flaemmchen proves to be more than capable of putting her acting chops up against the likes of the Barrymore brothers. Anyone who's only seen her often over-wrought portrayals of long-suffereing women in the films she made in the 40s ought to see how deftly she handles this role.